Barcelona city centre, Gothic Neighbourhood, Jul 2018. Tourists rent kickscooters while an eviction of a local resident takes place in the background. 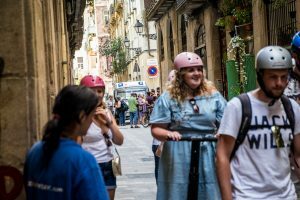 In 1990 Barcelona received 1.7 million tourists; last year the figure was 32 million – roughly 20 times the resident population. The sheer volume of visitors is driving up rents, pushing residents out of neighbourhoods, and overwhelming the public space. Attracted by this figures, vulture investors, often from abroad, are heavily speculating in the city’s housing market. As a result, between 2015 and 2017 over 12.322 eviction were carried out, more than 4,000 per year. Is the Catalan city dying out of its own success as a tourist brand?